The palace of Boru ( Brian Boru was King of all Ireland ) - is a national heritage centre at the foot of the Rock of Cashel. this cultural village is designed around a village green and is home to the study and celebration of native Irish music, song, dance, storytelling, theatre, genealogy and Celtic studies. 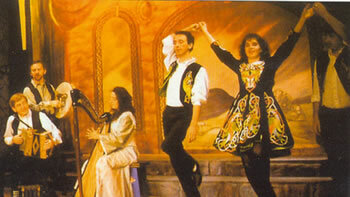 Visitors to this unique centre will be entertained by the resident BRU BORU group who have given Irish traditional music, song and dance a whole new stature in the world of entertainment. They have entertained the President of the United States, the Prime Minister of Australia, An Taoiseach, many Ambassadors, Frank Sinatra, Liza Minelli and thousands of fans from all over the world. The Centre comprises a well equipped theatre, frequent performances, banquets in the centre's restaurant, an informal Teach Ceoil - sessions nightly, a fully computerised genealogy service, an exhibition hall and craft shop.